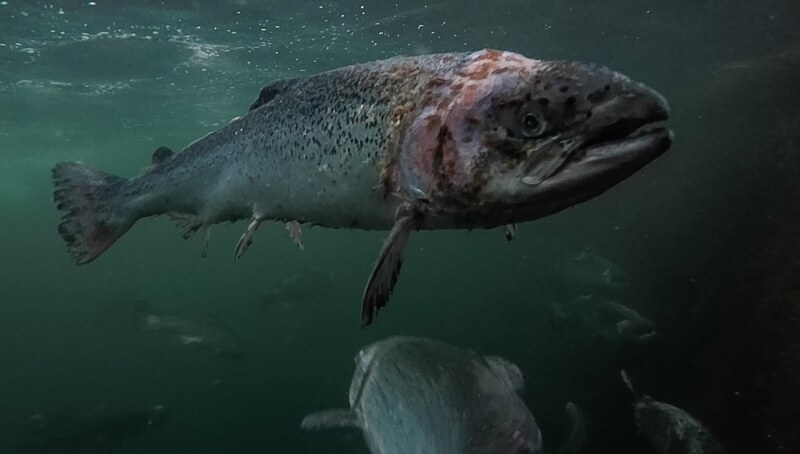 Gross overstocking and arrogance is revealed in two submissions to the Minister for Agriculture, Food and Fisheries recommending the withdrawal of Marine Harvest’s salmon farming licences in Donegal and Cork. The claim is based on two submissions to the Minister by the Principle Officer of the Department’s Aquaculture and Foreshore Division published by Friends of the Irish Environment at the Oral Hearing for a new salmon farm in Bantry Bay by Marine Harvest, the Norwegian multi-national that produces more than 80% of Ireland’s farmed salmon. 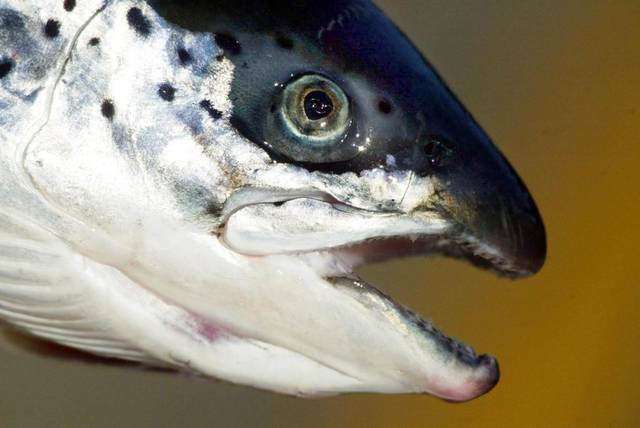 In the case of Donegal’s Lough Alton, which supplies 80% of Marine Harvest’s smolts, ‘by its own admission the company exceeded its stocking limitation by a significant degree (17%) for commercial reasons,’ the Report states. At Inishfarnard in the Kenmare River Special Area of Conservation, gross overstocking has been recorded in the annual Department’s Fin Fish Farm Inspection Reports since 2012. An application for increased capacity was refused by the Minister in 2010 as ‘Such a major increase in stocking capacity would have to be the subject of a new licence application accompanied by the necessary Environmental Impact Statements’. The Inishfarnard site, which is licensed to contain no more than 500 tons of fish, had a standing stock that was 26% above the permitted level before the input of 820,604 young fish in March 2014, this input itself being 105% in excess of the permitted level of 400,000 fish. 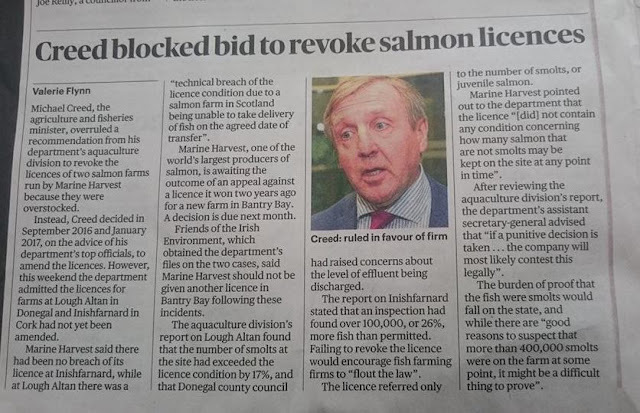 Marine Harvest, the Norwegian multi-national that produces more than 80% of Ireland’s farmed salmon, called the licensing system ‘Anachronistic, legally and technically meaningless in its application to modern good farming practice’. FIE published the reports as part of its presentation to the recent Oral Hearing of a number appeals against the company’s proposed new salmon farm in Bantry Bay. They told the Oral Hearing, held in Bantry earlier this month, that ‘an applicant who openly informs a licencing authority that he has no intention of meeting his licencing conditions is not a fit person to hold a licence’. The detailed 20 page submissions were rejected by the Minister because of proportionality and the commercial consequences to the company. According to FIE Director Tony Lowes, who made the presentations, the publication of the Reports in hard copy and electronically at the Oral Hearing was not covered by the local or national press present. Complementing the UK’s Sunday Times, which today is covering the story, Mr. Lowes said that ‘if the Washington Post was right in saying that ‘democracy dies in darkness’, our struggle to bring out the story shows that the lights have been truly extinguished by the Irish media’.